There's got to be a first bank failure for 2010 somewhere. Might put Bellingham on the map, for 15 minutes at least. 15 minutes of fame. 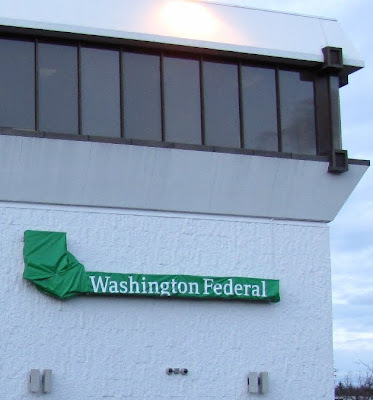 Horizon Bank is now part of Washington Federal. The FDIC is doing it's thing and supposedly that transition will be seamless for customers and most employees except for the top, so I read. I haven't used that bank so it's still, basically, just a news item to me. I felt like I should do a blog entry about this even though I don't have anything significant to add. Not hard to get some images. This momentous news item is just a few blocks away. Notice old sign covered over with new name on plastic tarp. (Tarp, like TARP funding?) No pun intended. They'll likely mint new signs later. I have a lot of thoughts about economics in this blog, but not much related to this bank. 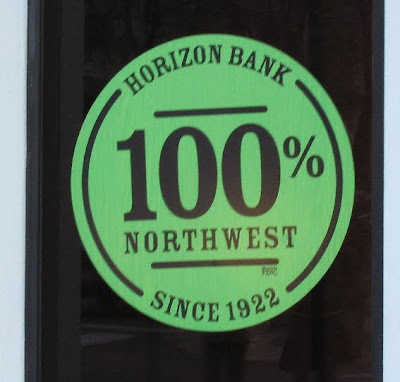 Several years back, I wrote about the proposed development on Chuckanut Ridge that Horizon Bank was involved in.